Small Space Sets are on trend…and our Outdoor Interiors 4pc. Conversation Set is the ultimate in mid-century styling with our (2) barrel chairs, matching love seat and accompanying teak coffee table. 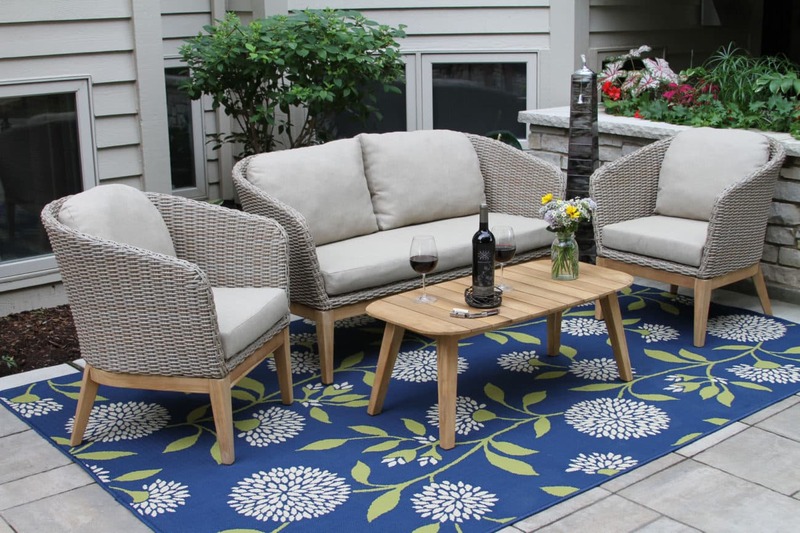 The Outdoor Interiors Vineyard Teak Collection 4pc. Conversation Set ships in one carton for easy, clean shipping and is crafted from the highest quality materials starting with all-Natural Plantation Grown Brazilian FSC Teak hardwood for long lasting outdoor use and exceptional durability in all climates. Our Ash Grey HDPE all-weather wicker barrel arm chairs and love seat are all hand woven around durable powder coated aluminum frames for lasting durability. This set includes a matching all teak coffee table. Olefin fabrics and stainless steel hardware complete this set. If the fabrics become soiled, use mild soap like Dawn or Palmolive mixed with water and a soft rag or soft bristle brush to clean. Hardwood oils will stain the fabrics if they come in contact.